The number of ‘hits’ returned by the Google search engine when queried about a “___ year plan”. Blue bars are the results from using the word for the number of years, red bars represent the same query using the numerical value. Whenever I present a public lecture on SETI, I can almost guarantee that the title of this article will be one of the questions I get from the audience. During our 1997-99 workshops on the next two decades of SETI research here at the SETI Institute, the workshop participants took the question of an active transmission strategy very seriously. The results of their deliberations have been published as SETI 2020: A Roadmap for the Search for Extraterrestrial Intelligence. They concluded that transmission is NOT an appropriate strategy, at least for the next two decades. Humans need to grow up first. To understand this conclusion, it's necessary to appreciate that there is a fundamental asymmetry in our current situation: we are a hundred-year-old technology in a ten-billion-year-old galaxy. At the workshops Harvard physicist Paul Horowitz summarized things very well; he said: "If it happens at all, there always has to be a first contact between two technological civilizations. Statistically, it is extremely unlikely that our fist contact with an ETI civilization will also be its first contact with an ETI civilization. Thus the advanced technology we detect will have experienced this type of encounter many times before. It already may have established a galactic protocol for information interchange, to which ab initio transmissions by Earth will have no chance of adhering. Thus we justify our asymmetrical listen only strategy by recognizing our asymmetrical position amongst galactic civilizations. We are among the very youngest!" How can we be so sure of our asymmetric position? Any technology that is observable over interstellar distances cannot be more primitive than our own. After only 100 years of manipulating the electromagnetic spectrum, we find ourselves in the midst of an exponential explosion of technology. But it has taken us over 4.5 billion years of planetary and biological evolution to get to where we are today. If there is detectable technology out there, it is statistically improbable that their evolution and development will be fine-tuned to coincide precisely with our current emerging technological capabilities. They will be older, potentially billions of years older since the Milky Way Galaxy was around for at least five billion years before our solar system began to form. Sitting in the midst of our own exponential increase in technological capability, we cannot imagine what an older technology might look like. Thus far, we've never experienced any exponential growth in nature or culture that does not reach some resource limit and saturate, or crash. Some futurists speculate about the 'singularity' that must occur when change takes place on timescales that are too short for humans to adapt, and the post-biological entities that might evolve to accommodate the exponential - or not. Transmitting is a harder job than listening, and so we put the burden of transmission on the older technologies. Of course if there are no older technologies, then our searches will not succeed. In the future we may decide that we are indeed the first, that we will have to figure out how to survive to a ripe-old cosmic age, and that we have a responsibility to transmit for the benefit of technological civilizations yet to emerge. In that case, we will have to answer the difficult questions: Who will speak for Earth, what will they say, and how long will they have to say it? The first two questions are obvious, and difficult to answer in the absence of any terrestrial system of global governance. The third question derives from cosmic distances and temporal synchronicity. The Milky Way Galaxy is a flattened collection of stars and gas and dust about 100,000 light years across, and we are not located anywhere near its center. It would take any sort of electromagnetic signal that we transmitted 70,000 years to reach the most distant parts of the galaxy. In order for an ETI civilization to detect our transmission, their instruments must be looking in our direction at the time our signal arrives (and of course they must have chosen the right instrument). The chances of that happening are zero, unless we commit to transmitting for a long time. Then when they do get around to searching in the right way, our signal will be there and they will succeed. For us to realize that they have succeeded, they will have to transmit a reply back to us, and that could take another 70,000 years to arrive! Listening could succeed tomorrow, but transmission is a long-term strategy. As yet humans are not very good at this sort of long-term planning. I spent an enjoyable afternoon with Google Ô in order to try to quantify just how far humanity might be from managing a transmission strategy over cosmic timescales. I used the search engine to query the phrase "____ year plan", where the blank was filled in with either the numeric value or word for the time duration in question. I searched on both variants and tallied the number of 'hits' in order to be inclusive, but they are by no means independent measures. Often the word will be used in the title of a plan, while the numerical value appears multiple times within the text body. I searched from one to one hundred thousand years, and the results are given in the figure. In order to decide what planning horizon humans were seriously considering, I made a query on my own name. I would contend that any planning activity that does not return more 'hits' than does my name (as indicated by the green arrow at the top of the chart) is hardly a serious undertaking for our species. Using that criterion, I conclude that we are reasonably interested in (but not yet demonstrated to be competent in) making plans for a single generation into the future. For the longer-term queries, the number of 'hits' was sufficiently small to permit some exploration of who or what were thinking (or at least publishing to the web) about such timescales. 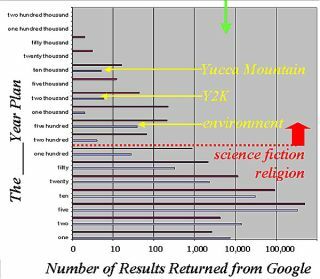 For 100 years and beyond, the results are dominated by science fiction and religion. Environmentalists have begun to write and attempt to plan for a five-hundred-year timescale. The Y2K and the new millennium caused a spike associated with 2000 years. The radiative decay half-life for the waste products of fission power generation is responsible for a serious U.S. effort to construct a storage and containment facility that is safe and reliable for 10,000 years. Ten thousand years is also the planning lifetime for the Clock of the Long Now Foundation. It is perhaps less important that the clock is still ticking 10,000 years from now than that Yucca Mountain (or some other facility) remains intact, but the clock is a very useful tool for encouraging humans to adopt a long-term approach to the future. It might be worthwhile to investigate whether the clock could transmit as well as tick.